Halfway through my interview with world renowned documentary photographer, Brent Stirton, I lean in and tell him that I think I have a line to the Dalai Lama. Stirton’s response seals my suspicions; asking the Dalai Lama to make a public stand against ivory will only anger the Chinese Government. Their citizens are by far the biggest consumers of ivory, and so it is China we have to win over. Brent Stirton has done it harder so that we can walk further. For more than 9 months of the year he traverses the continents, investigating critical global issues, and unveiling the interwoven fabric of societies through his profound visual interpretations. Working alongside investigative reporter Bryan Christy, they exposed the booming ivory trade in Buddhist and Catholic religious objects in the 2012 National Geographic cover story, Blood Ivory. But far too little has been said about the role of religion since this story hit the headlines. Most ivory objects are religious objects, with extraordinary sculptures fetching six figure price tags – but clearly there is a disconnect between the craft and where the ivory comes from. Every day nearly 100 elephants are brutally killed in Africa, their bodies riddled with bullet holes, and their faces butchered with axes until the tusks are yanked out. I was raised Catholic, but have followed Buddhism most of my adult life. People buying ivory have a right to know that their purchase is causing incredible trauma. Elephants are highly intelligent beings, and they have long term supportive bonds between family members, so it’s not just a species facing extinction, its massive individual suffering. Many people still believe that ivory comes from elephants that die a natural death. Only a very small percentage of Chinese people buy ivory, but with such a large population, that small percentage has devastating effects. Illegal ivory is flooding into China, and using legal pathways as cover. So why does the Chinese government, on one hand support environmental debate, and on the other hand they still refuse to shut down the carving factories? But if China cares so much about business in Africa, then surely the African leaders have the advantage, and they can put pressure on China to shut down the ivory carving factories? Brent Stirton has witnessed some of the most unprecedented elephant killings in Africa. Back in 2012 Stirton covered one of the largest mass elephant slaughters in decades, when, armed with grenades and AK-47s, poachers entered Bouba Ndjidah National Park in Cameroon, and gunned down more than 600 elephants over a three month period. They even killed the babies. That same year Stirton also took first prize at the World Press Photo Awards for his assignment, Rhino Wars, which included documenting the work of the IAPF rangers based in Zimbabwe and South Africa. I tell Stirton that we’re currently trying to source ‘military leftovers’ for the rangers, and I will return to my African homeland in October, joining the IAPF rangers on the frontline, and writing ‘stories from the trenches’. The objective of that mission is to showcase the brave work of the rangers, and inspire people everywhere to take action in their own country. Suspects of the attempted assassination on Prince de Merode include the FDLR – a group of guerrillas who have been living in the park since 1996 – as well as charcoal traders and people associated with a British oil company attempting to illegally explore for oil in the national park. 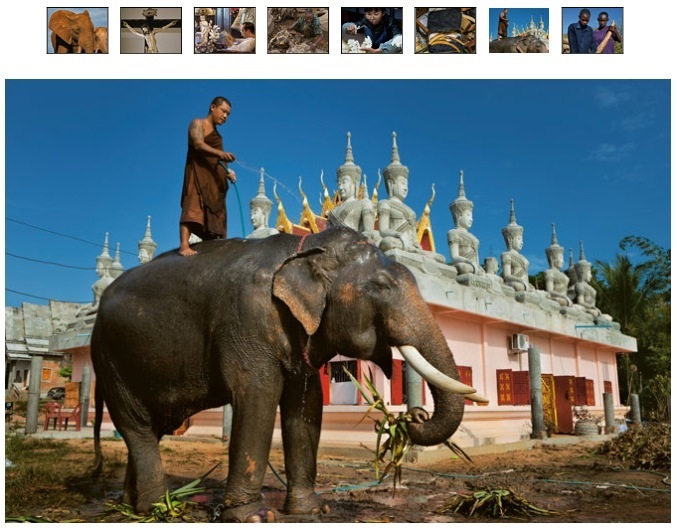 In other parts of the world, and on a smaller scale, the demand for ivory religious objects by devout Catholics, in places that include the Philippines and The Vatican, is also fuelling this vile trade. But the issue was quickly swept away, and now with Pope Francis at the helm – a spiritual leader frequently linked with defending the environment – it is in his power to lead the charge and encourage The Church’s 1.2 billion members to become defenders of elephants. Last year Elizabeth Chitwood, founder of Elephantopia, collected nearly 12 000 signatures through an online petition, calling for the world’s largest religion to take a prominent stand for the world’s largest mammal. She called, emailed and mailed a hard copy to the Vatican, but they never did respond. Elephants are a keystone species, and so it’s not only elephant families being destroyed, but vital ecosystems humans depend on. We’re heading towards the sixth extinction, and if we cannot save the big things, if we cannot save our majestic elephants, then how are we ever going to save the small things? The illegal ivory trade is funding transnational crime syndicates and environmental terrorism, yet mainstream news is asleep at the wheel – and so it is up to every one of us to be a driving force for change. We can and we must do more. Read: Blood Ivory, National Geographic, Oct 2012. By Bryan Christy. Photographs by Brent Stirton. Another important article, Jamie. Well done. I hear what you say about religion etc. I am lost for words AGAIN……. It’s very sadly true, and ironic, that Christians (and this frustrates me as one) so vehemently preach intelligent design/creationism, yet are so silent on the plight of the very creatures God created. The focus is mostly on “saving” humans, and animals/nature have been forgotten (it occurs to me that this may be because the ultimate goal is “Heaven”, but that certainly doesn’t mean that we should give up/not care about what happens to the wildlife). Looking forward to reading about your experience with the IAPF. All the best! Soon they will be gone. Excelente y completo informe. Devastador por las consecuencias que muestra suceden a traves del comercio ilegal del marfil para nada. Aqui estamos a la orden, lejos pero dispuestos a acompañarlos en las campañas. Great thanks to Brent,Robyn and other enviromentalists for opening our eyes about the shrinking wild!But my anger goes to African leaders who act nice to the environment yet they perform greedy acts on it!Our leaders why are u selfish,selfish to the extend u even encroach on what is not yours!Take an example of India,they have elephants but how many times have u been hearing that they have killed elephants in mass no. ?China has put its law where by u are cought with cocaine,u are screwed by the death penalty so why not put African elephants to be cocaine in China?Why not follow those behind the poachers because those poor fellows in the photoes have no ships neither aeroplanes to transfar ivory to China,they’re greedy people in governments behind this!Please China government,leave alone our elephants,leave the African elephants alone!I wonder that some religious beliefs,they are also engaged in using ivory to carve their objects,please u religious leaders feel pity of these disapearing species,i know if Pope sees our cries ,he will preach a stop on ivory objects in churches and every place conserned!CHINA LEAVE AFRICAN ELEPHANTS ALONE!